The wrist joint is replaced with an artificial joint (also called a prosthesis) much less often than other joints in the body, such as the knee or the hip. Still, when necessary, this operation can effectively relieve the pain caused by wrist arthritis. When severe arthritis has destroyed the wrist joint, artificial wrist replacement surgery (also called wrist arthroplasty) can help restore wrist strength and motion for many patients. The anatomy of the wrist joint is extremely complex, probably the most complex of all the joints in the body. The wrist joint is actually made up of many joints and many bones. These joints and bones let us use our hands in many ways. The wrist must be extremely mobile to give our hands a full range of motion. At the same time, the wrist must provide the strength for heavy gripping. The wrist is made up of eight separate small bones, called the carpal bones. The carpal bones connect the two bones of the forearm, the radius and the ulna, to the bones of the hand. 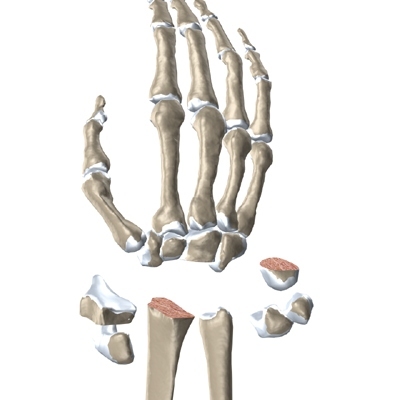 The metacarpal bones are the long bones that lie mostly underneath the palm. The metacarpals are in turn attached to the phalanges (the bones in the fingers and thumb). 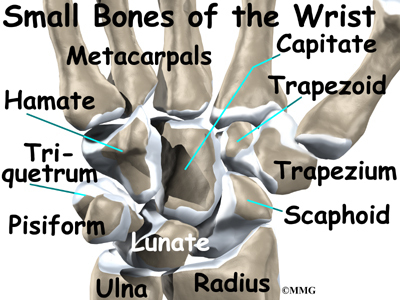 One reason that the wrist is so complex is that every small bone forms a joint with the bone next to it. 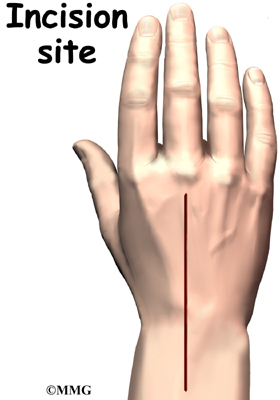 This means many small joints make up the wrist joint. Ligaments connect all the small bones to each other, and to the radius, ulna, and metacarpal bones. Articular cartilage is the smooth, rubbery material that covers the bone surfaces in most joints. It protects the bone ends from friction when they rub together as the joint moves. Articular cartilage also acts sort of like a shock absorber. Damage to the articular cartilage eventually leads to degenerative arthritis. 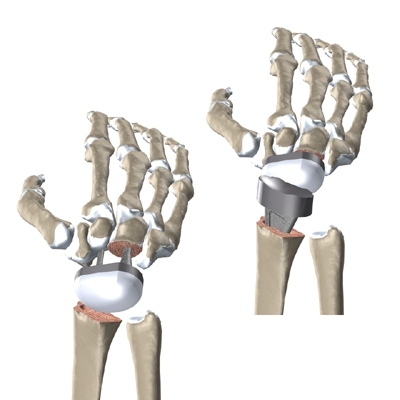 What conditions lead to wrist joint replacement? The main reason for replacing any arthritic joint with an artificial joint is to stop the bones from rubbing against each other. This rubbing causes pain. Replacing the painful arthritic joint with an artificial joint gives the joint a new surface, which lets it move smoothly without causing pain. Many operations are used to treat problems in the wrist. A fusion surgery can get rid of pain and restore strength in badly degenerated wrist joints. Fusion surgeries make the wrist strong again, but they greatly reduce the wrist's range of motion. This makes fusion surgery a poor choice for some people. 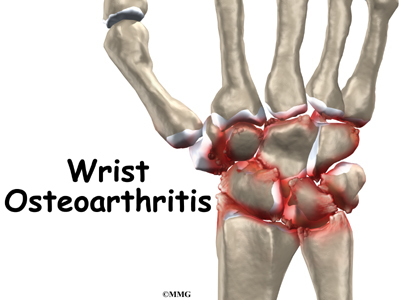 Arthritis caused by systemic diseases, such as rheumatoid arthritis, often affects both wrists. People with arthritis in both wrists probably should not have two fusion surgeries. Two wrist fusions make it very difficult to do everyday activities. If both wrists require surgery, many surgeons recommend fusing one wrist for strength and replacing the other wrist with an artificial wrist joint. This allows the patient to have one strong hand and one hand with a good range of motion. Some severe degenerative problems of the wrist may require replacement of the painful joint with an artificial wrist joint. You and your surgeon should make the decision to proceed with surgery together. You need to understand as much about the procedure as possible. If you have concerns or questions, you should talk to your surgeon. You may also need to spend time with the physical or occupational therapist who will be managing your rehabilitation after surgery. This allows you to get a head start on your recovery. One purpose of this pre-operative visit is to record a baseline of information. Your therapist will check your current pain levels, your ability to do your activities, and the movement and strength of each wrist. A second purpose of the pre-operative therapy visit is to prepare you for surgery. You'll begin learning some of the exercises you'll use during your recovery. Your therapist can also help you anticipate any special needs or problems you might have at home, once you're released from the hospital. On the day of your surgery, you will probably be admitted to the hospital early in the morning. You shouldn't eat or drink anything after midnight the night before. Come prepared to stay in the hospital for at least one night. What happens in a wrist replacement surgery? Before we describe the procedure, let's look first at the artificial wrist itself. Some early artificial wrist joints were made entirely of flexible silicon plastic. These plastic joints were used primarily as spacers to keep the joint surfaces from rubbing together. 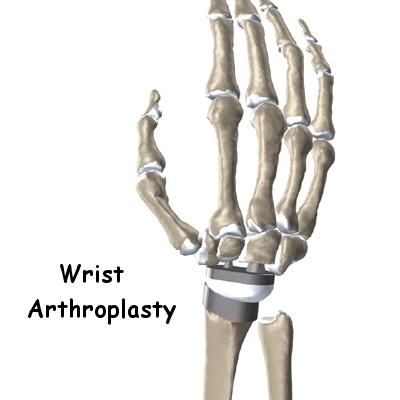 Modern artificial wrist joints are made of metal and plastic. 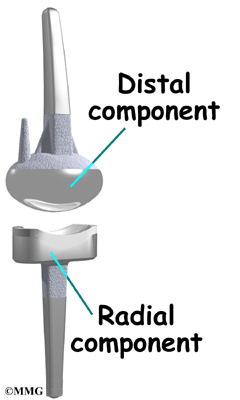 The part that fits against the end of the radius bone of the forearm is called the radial component. It is made up of two pieces. A flat metal piece is placed on the front part of the radius. It has a stem that attaches down into the canal of the bone. 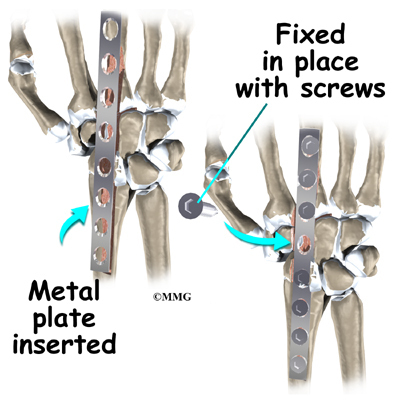 A plastic cup fits onto the metal piece, forming a socket for the artificial wrist joint. 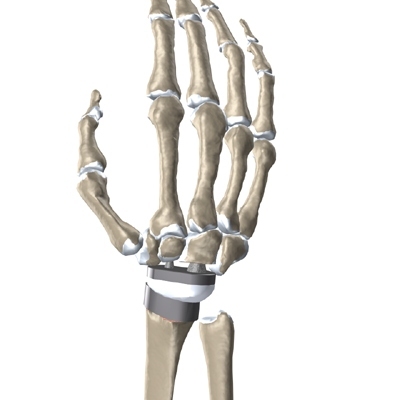 The part that replaces the small wrist bones is called the distal component. This piece is made completely of metal. It is globe shaped to fit into the plastic socket on the end of the radius. 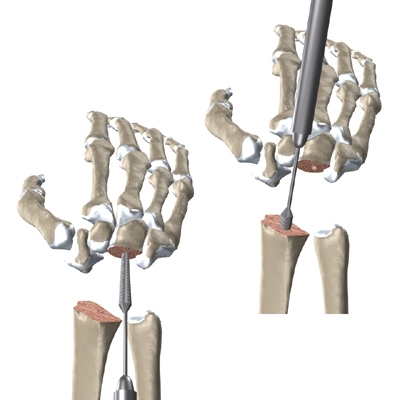 The metal distal component is attached by two metal stems that fit into the hollow bone marrow cavities of the carpal and metacarpal bones of the hand. The plastic used in artificial joints is tough and slick. It allows the two pieces of the new joint to glide easily against each other as you move your wrist. The ball and socket allow movement of the wrist in all directions. Wrist replacement surgery can be done under general anesthesia or regional anesthesia. General anesthesia puts you to sleep. Regional anesthesia puts only your arm to sleep. The surgeon will first make an incision through the skin on the back of the wrist. The tendons that run over the back of the wrist are then moved out of the way, and the surgeon cuts open the joint capsule that surrounds the wrist joint. The surgeon needs to make room for the artificial joint. To do this, most of the first row of carpal bones are removed from the wrist. The end of the radius is also shaped to fit the prosthesis. The hand bones and the radius bone of the forearm are then prepared with special rasps. The rasps are used to bore holes in the bone for the metal stems of the replacement joint. The surgeon will take some time to get the stems to fit tightly. The joint is put in place and tested through its range of motion to make sure it moves correctly. Once the surgeon is satisfied with the fit, the stems of each metal implant are cemented into place. The tendons are then placed back into their proper place, and the skin is stitched together. Does the surgery cause any problems? Infection following joint replacement surgery can be very serious. The chances of developing an infection are low, about one or two percent. Sometimes infections show up very early, before you leave the hospital. Other times infections may not show up for months, or even years, after the operation. If an infection occurs that involves the implant, a second operation will most likely be needed to remove the implant and fuse the wrist. 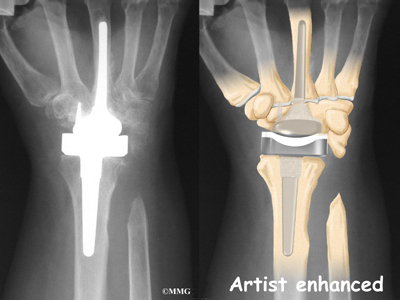 The major reason that artificial joints eventually fail is that they loosen where the metal or cement meets the bone. A loose joint prosthesis causes pain. Once the pain becomes unbearable, another operation will probably be needed to fix the artificial joint or to perform a wrist fusion. There have been many advances in extending the life of artificial joints. However, most replacements will eventually loosen and require another surgery. In the case of an artificial knee, you can expect about 12 to 15 years, but artificial wrist joints tend to loosen sooner. The risk of loosening is much higher in younger, more active patients. All of the nerves and blood vessels that go to the hand travel across the wrist joint. Because wrist replacement surgery takes place so close to these nerves and blood vessels, they may become injured during the procedure. If the retractors holding the vessels out of the way during surgery cause the damage, the symptoms are usually temporary. The nerves and blood vessels rarely suffer any kind of permanent injury after wrist replacement surgery, but this type of injury can happen. After surgery, your wrist will probably be put in a splint and covered by a bulky bandage. You may also have a small plastic tube that drains blood from the joint. Draining prevents excessive swelling from the blood. (This swelling is sometimes called a hematoma.) The draining tube will probably be removed within the first day. The bandage and splint will keep the wrist in a natural position during healing. Your surgeon will want to check your wrist within five to seven days. Stitches will be removed after 10 to 14 days, although most of them will have been absorbed into your body. You may have some discomfort after surgery. Your surgeon can give you medication to control any pain. You should keep your hand elevated above the level of your heart for several days to avoid swelling and throbbing. Keep it propped up on a stack of pillows when sleeping or sitting. You will wear an arm-length cast with the wrist placed in a neutral position for up to six weeks after surgery. A physical or occupational therapist will direct your recovery program. Recovery from wrist replacement surgery takes up to three months. The first few therapy treatments will focus on controlling the pain and swelling from surgery. Heat treatments may be used. Your therapist may also use gentle massage and other types of hands-on treatments to ease muscle spasm and pain. Then you'll begin gentle range-of-motion exercises. Strengthening exercises are used to give added stability around the wrist joint. You'll learn ways to grip and support items in order to do your tasks safely and with the least amount of stress on your wrist joint. As with any surgery, you need to avoid doing too much, too quickly. Some of the exercises you'll do are designed to get your hand and wrist working in ways that are similar to your work tasks and daily activities. Your therapist will help you find ways to do your tasks that don't put too much stress on your wrist joint. Before your therapy sessions end, your therapist will teach you a number of ways to avoid future problems. Your therapist's goal is to help you control your pain, improve your strength and range of motion, and regain your hand's fine motor skills. When you are well under way, regular visits to the therapist's office will end. Your therapist will continue to be a resource for you. But you will be in charge of doing your exercises as part of an ongoing home program.